Stathis Kontos explains why on only his second day on Tilos, he began looking for a house to stay permanently. I had no link to Tilos. I arrived one Sunday in the depths of winter after a 17-hour ferry boat voyage. I fell in love with it immediately. The very next day I began looking for a house to stay permanently. Living here, I cycle and walk a lot. We all walk a lot. The island has an area of 65 square kilometers – you can walk from one end to the other in about three hours, while there are 54km of marked routes. My favorite walk begins in Livadia, the port, from where one heads northwards. You cross the mountain, smell oregano and thyme, and might see a Bonelli’s eagle soaring overhead. The entire island is part of the Natura 2000 network of protected sites; many wild birds live here and many migratory species stop on their journeys. In an hour and a half you reach Lethra, a serene beach with small white pebbles and turquoise waters. Another beach that I would recommend is Plaka: sand, palm trees and peacocks that come right up to you. In fact, if you’re not careful they’ll steal the crackers out of your bag. When the sea is calm, either with a canoe or inflatable boat, you can enter the secret cave behind Livadia. You’ll find it by asking – or even better, by exploring. 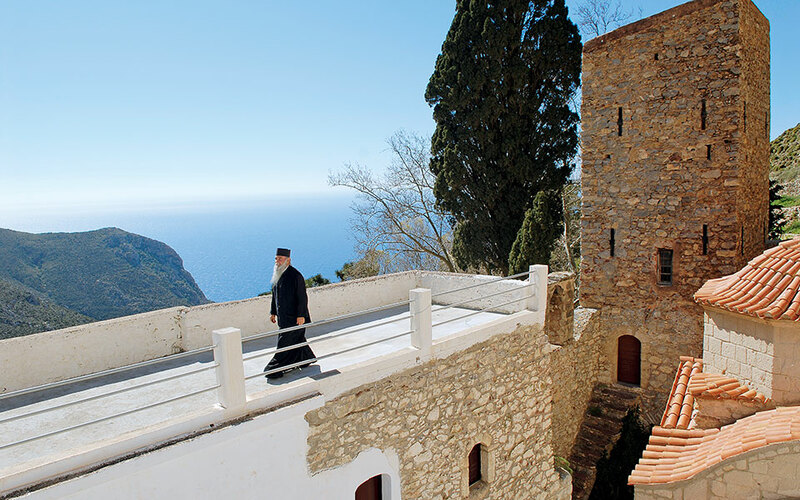 The best place to see the sunset is from the balcony of the Monastery of Aghios Panteleimonas, which was built in the 16th century and has a view of the entire southern part of the island, which is uninhabited. In the distance you can see Kos and Nisyros. Over the past two years tourist traffic has increased. On my walks I encounter a lot of Scandinavians, Italians and Brits. 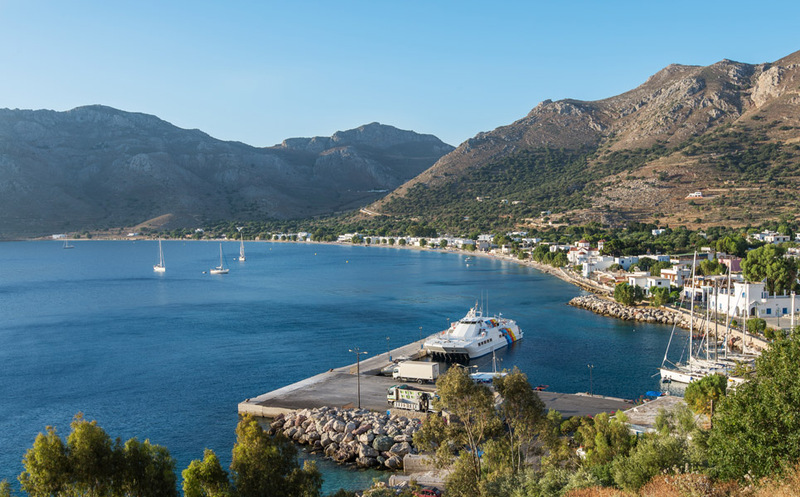 Because Tilos is a remote island, most foreign visitors stay for about 2 weeks. It is calm, one of the best holiday destinations for families. In the winter we are about 500 residents. The good thing about small islands is that they make you more social. The ultimate meeting point after 23.00 is Mikro Horio, the abandoned medieval settlement that now has life again thanks to a group who have created a bar there. That is, they have placed tables among the ruins and serve cocktails and drinks until morning. It is very romantic. You sit under the stars and many wait to see the sunrise. Some have heard of Tilos due to its dwarf elephants. In a cave on the island 4,000-year-old fossils were found from about 40 animals, the largest single collection of remains of these animals ever found. These were the last dwarf elephants in Europe. They are estimated to have stood only 1.20m – 1.50m tall. It is worth visiting the Dwarf Elephant Museum in Megalo Horio where you will soon be able to see a 3D model of the animal that was created by the University of Athens. You will eat well on our island. Almost every taverna serves goat stuffed with rice and liver which is cooked overnight in a wood-fired oven. 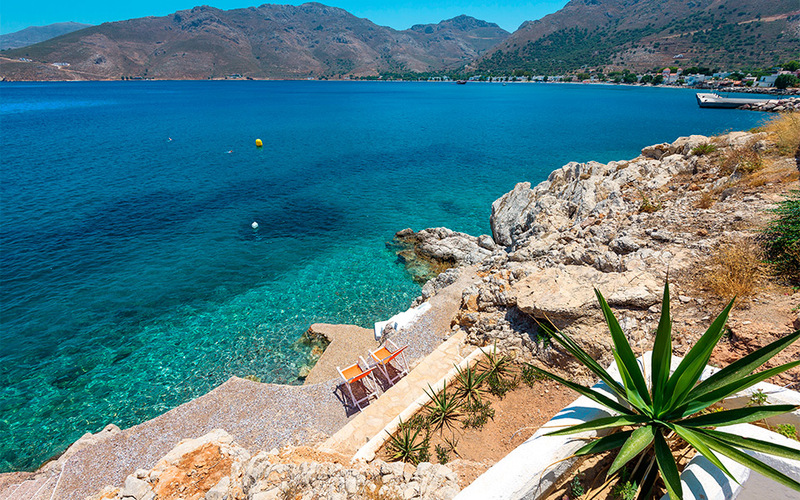 A great place for meat lovers is the taverna “To Kastro” in Megalo Chorio which has a sweeping view of the beach of Eristou, whereas for fish try golden grouper cooked over coals in “Taverna Michalis” in Livadia.